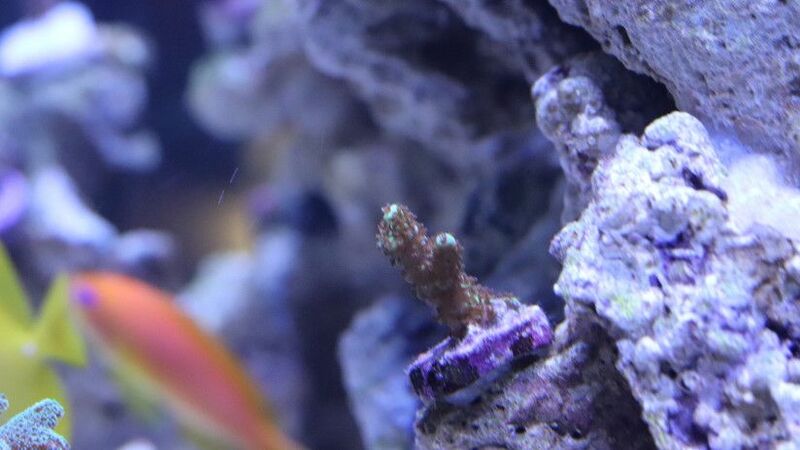 I am relatively new to reefing and have been researching best practices for maintaining a reef tank with fish. Been researching for the last year and have found a wealth of ideas, information, and recommendations here on this website and I wanted to share my build to contribute to the hobby. 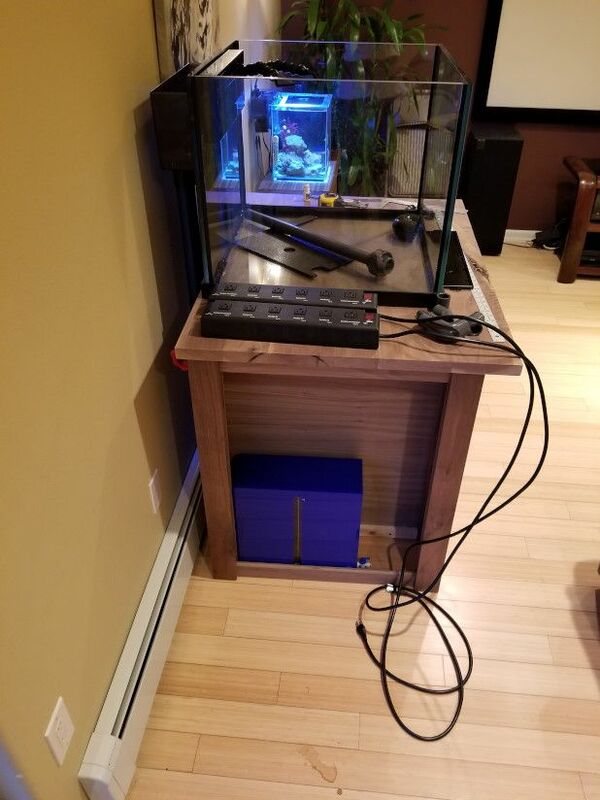 I plan to keep mostly SPS and a handful of fish. 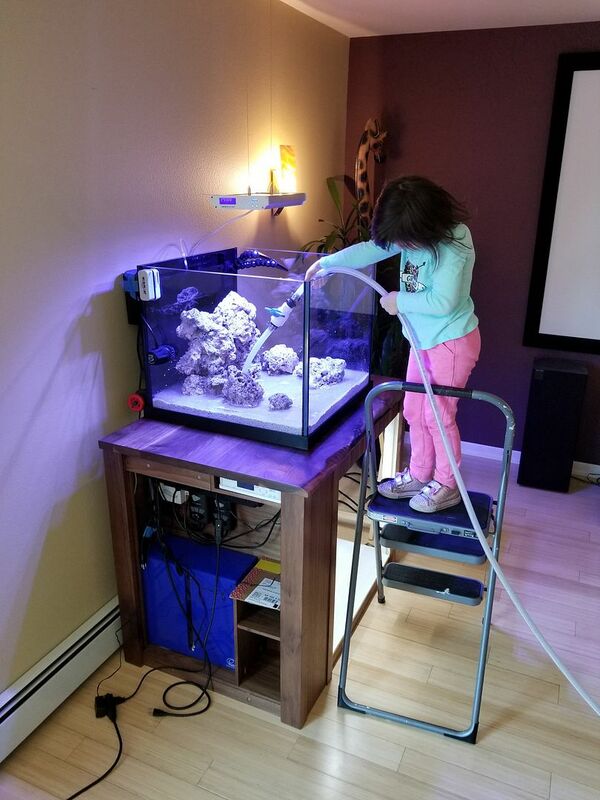 Last fall I built a 56g tall saltwater aquarium for my wife as she was also getting the bug. 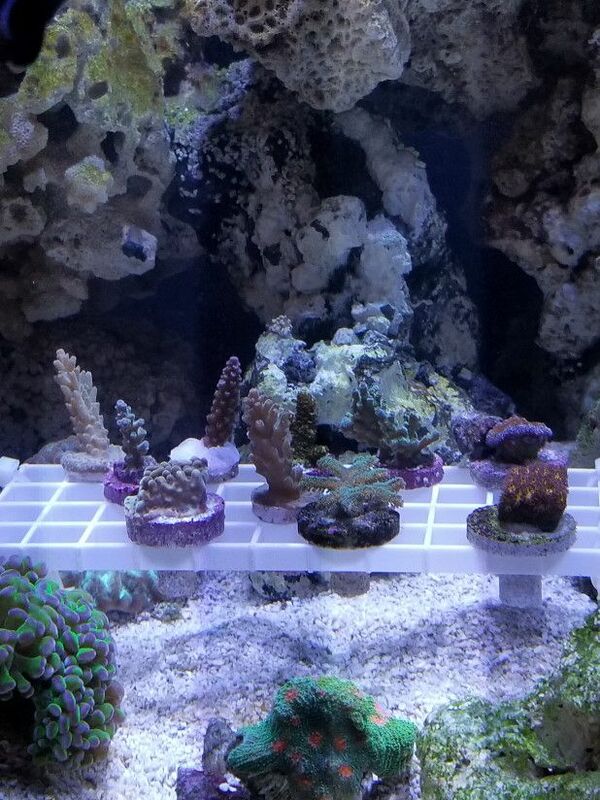 It has been running for 7 months and corals are starting to really grow. I have always liked cubes and wanted to start with something small. 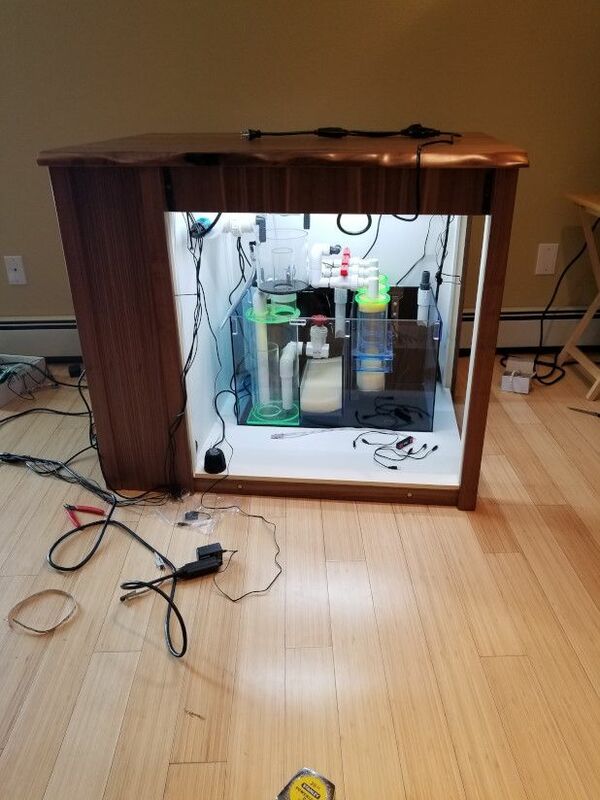 Here is my list of equipment and stocking list along with pictures of my build. 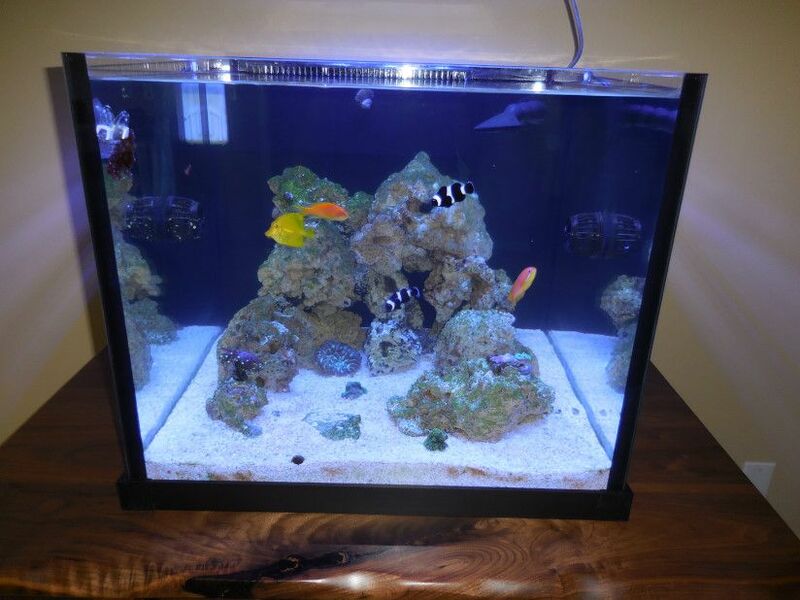 - 50g cube (24"L x 24"D x 20"H) by Custom Aquarium with low iron glass on front and sides. I welcome feedback and input as I pull this all together. 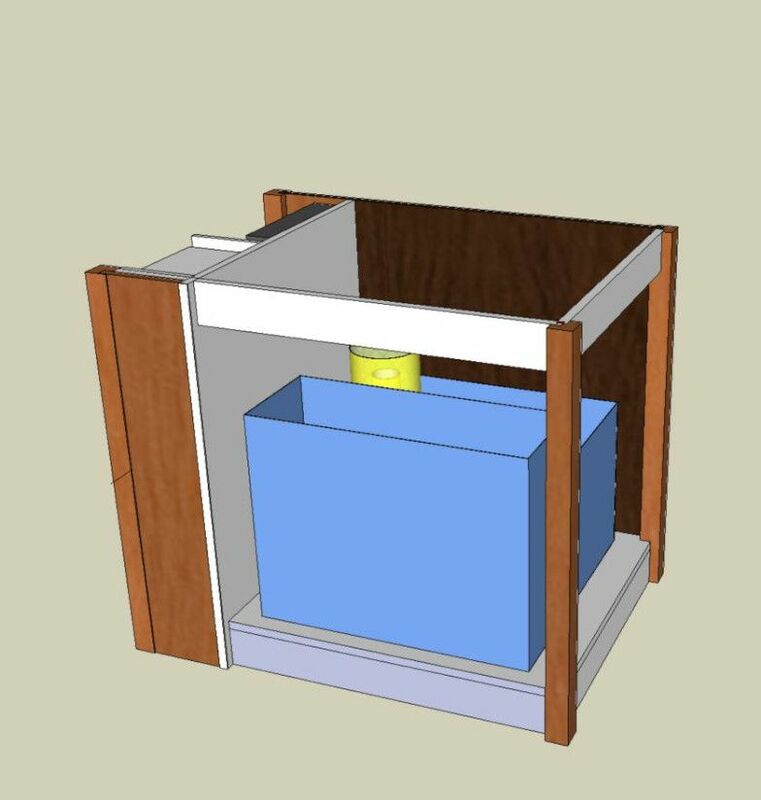 I started with a rendering using Google Sketchup to help me come up with the design, finishes, and parts list. 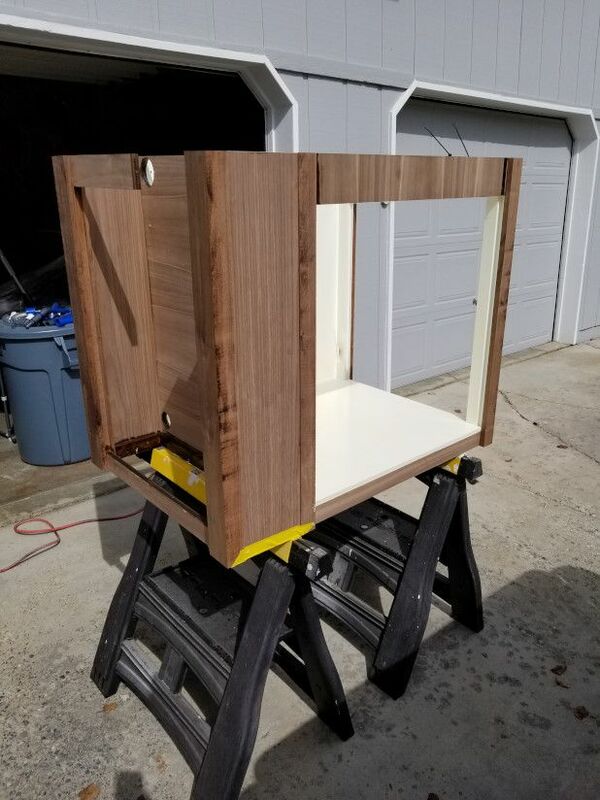 The stand is made of walnut and walnut plywood. 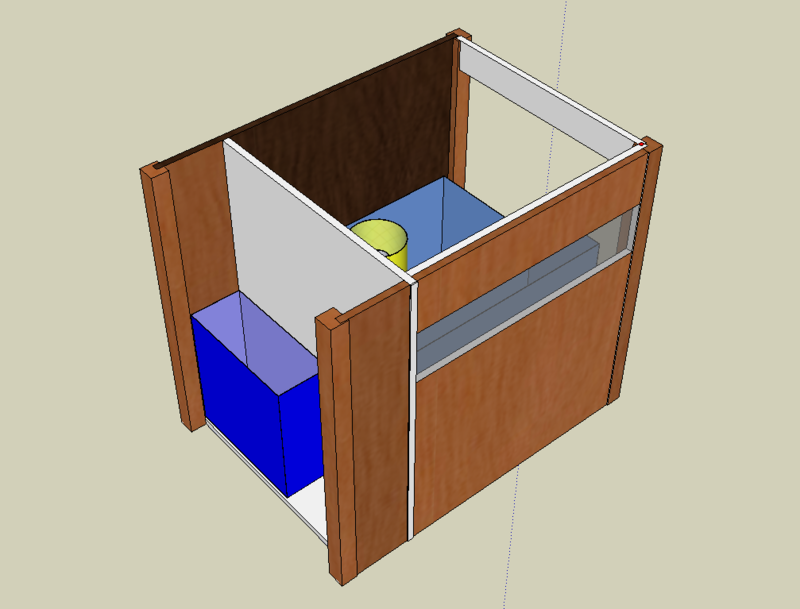 I intend to have two doors completely removable for servicing and these panels would be attached using magnets. The panels will also have a pane of tinted acrylic to be able to see the skimmer and reactors with their green accents. Another view of the stand with the dry side compartment which will have a normal swing door. 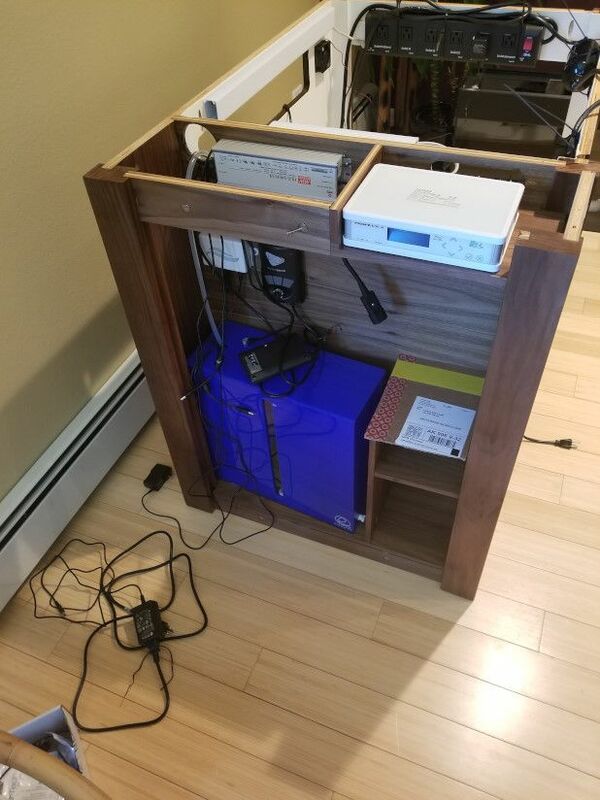 This will house most of the electronics and my ATO reservoir. 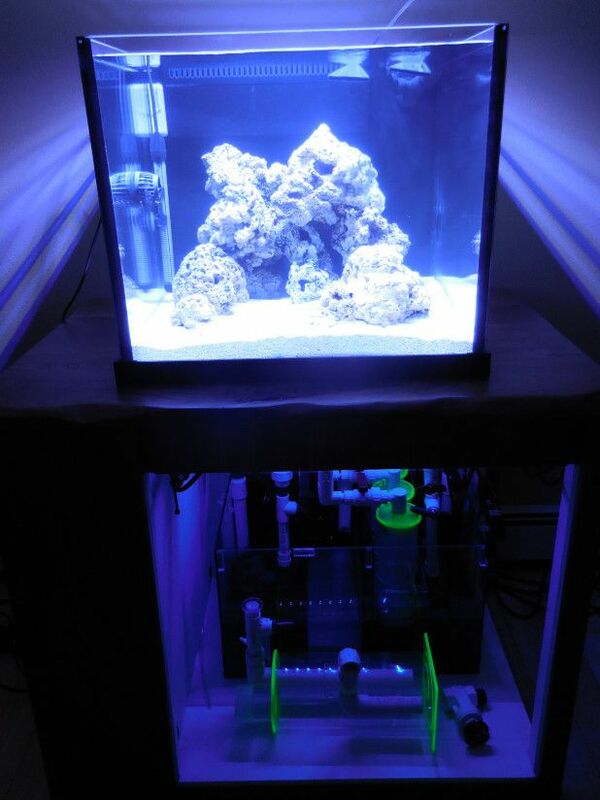 Here is a picture of the tank and the Lifereef sump and refugium. 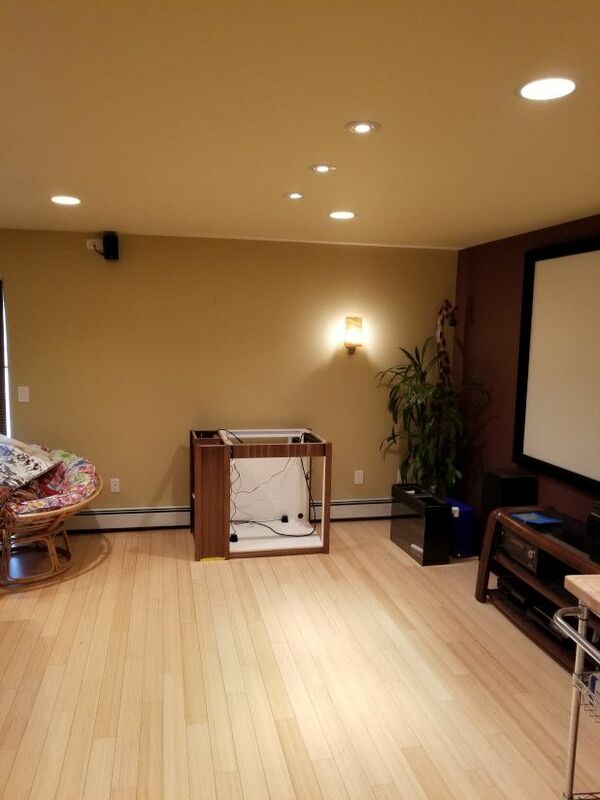 Here is a picture of the tank on the stand in the proposed location in our downstairs family room. 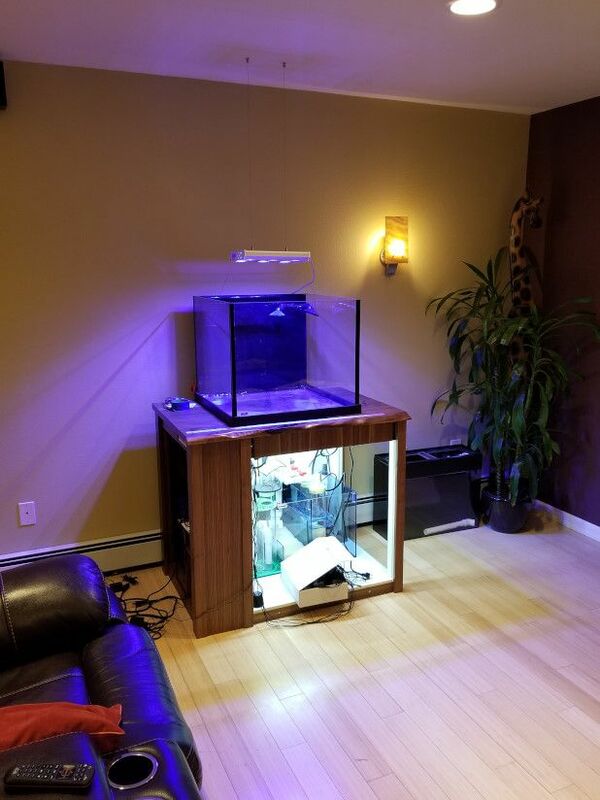 The nano tank will be moved to another room. Here are pictures of various phases of building the stand. 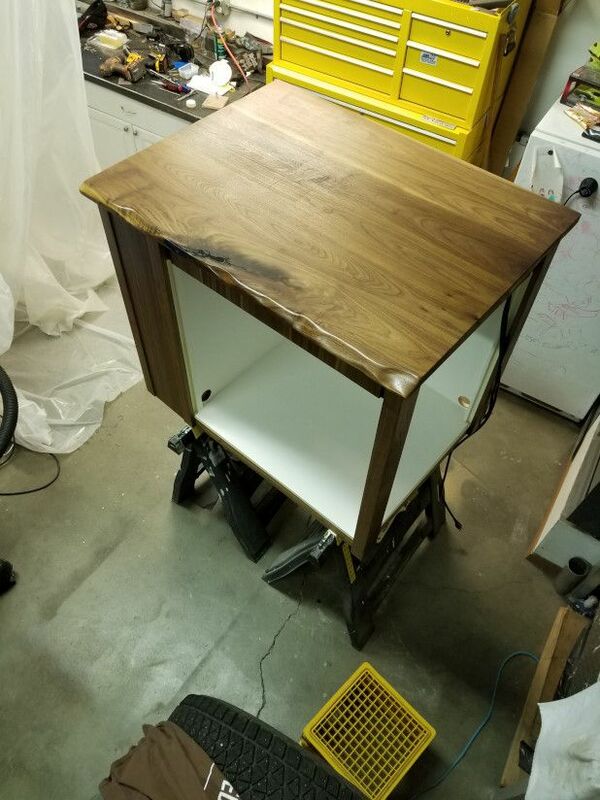 My buddy is a great craftsman when it comes to building furniture and he had all of the wood working tools especially a monster table saw. The strength of this stand comes from five 2" x 3" posts and the 3/4" walnut ply. 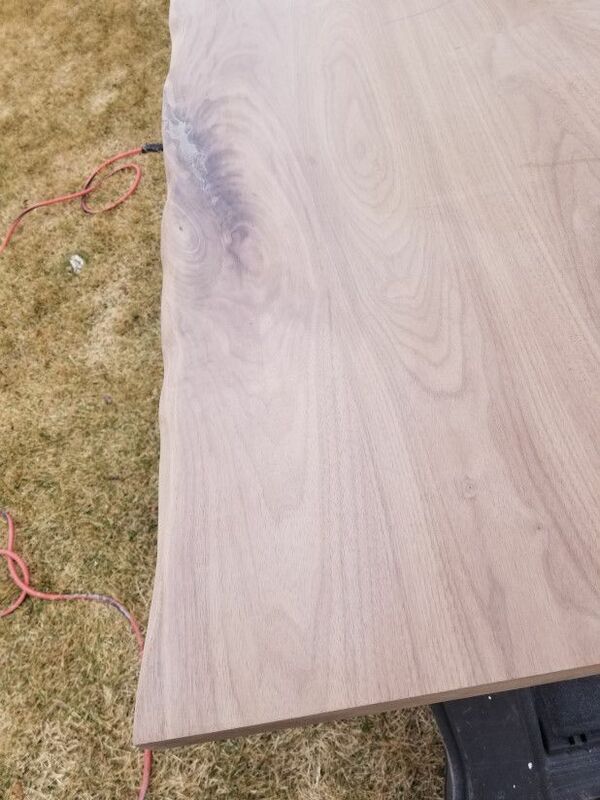 The top will be 1 1/4" butcher block style walnut with a live edge. 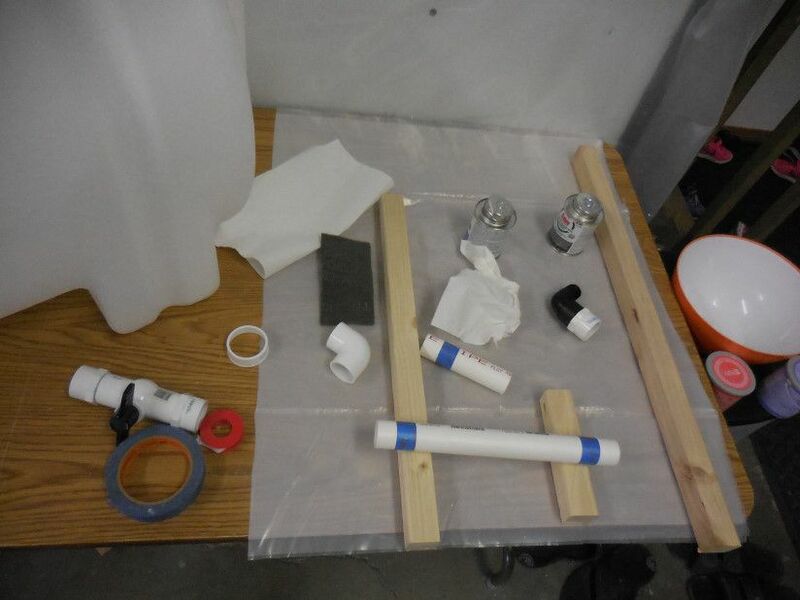 And some picture of the components and the blue PVC which I intend to use for the hard pipe plumbing. Here is the side compartment with the Esopps ATO reservoir. Topoff will be regulated with the Sentry ATO. 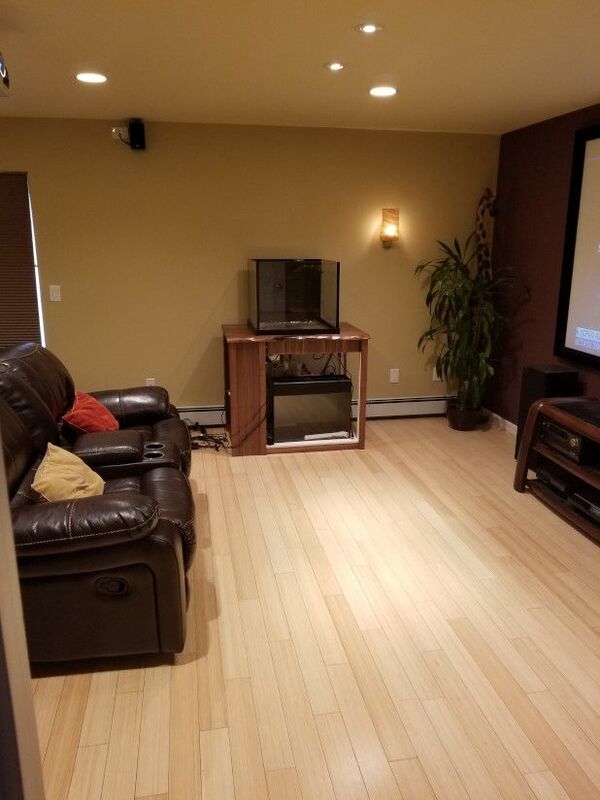 I will also add some shelves here for storage. This is where I am at right now. Cut a hole in the back of the stand for the drains and return. 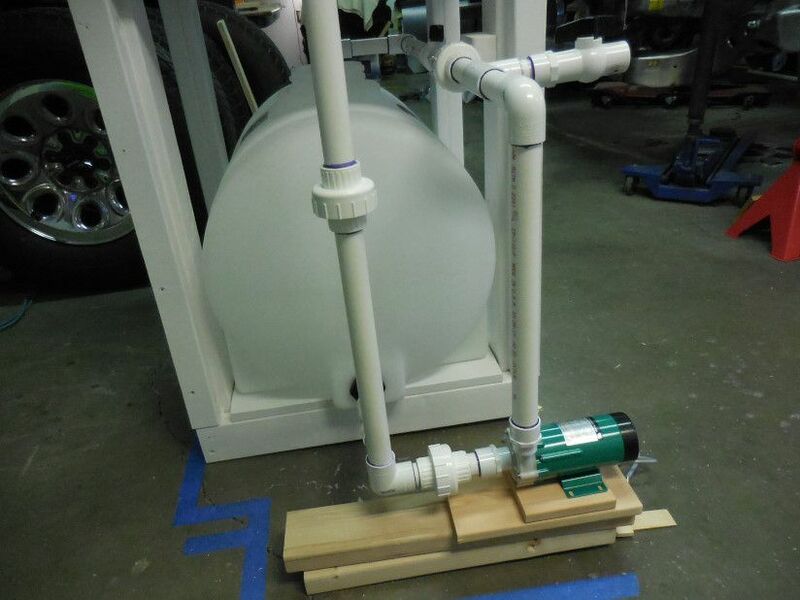 The pipes will have barb fittings and I will use flex tubing to the barb fittings in sump and pump. At the moment trying to figure out where the UV sterilizer will go and how it will be plumbed. Awesome looking tank and build. Everything looks very clean. I’ll be following along to see how it progresses. Best of luck. Thanks Rum! Been making good progress. I have a bunch of pics I need to upload. 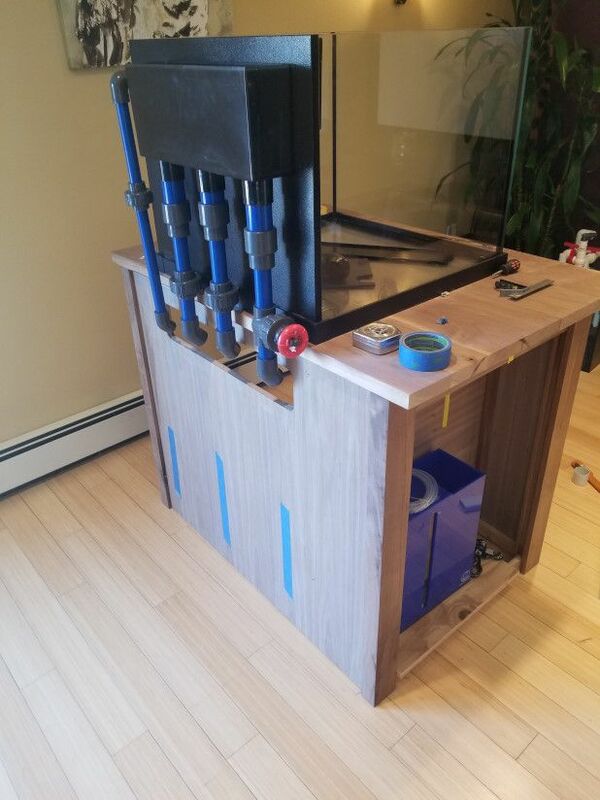 Top of the stand is finished and set the tank on it. Been doing cable management and installing last bit of components. Plumbing should go quick. Mocking up some scapes and have water ready to go. Oh and need to ceiling mount light before placing stand in final spot. Posting more updates soon. 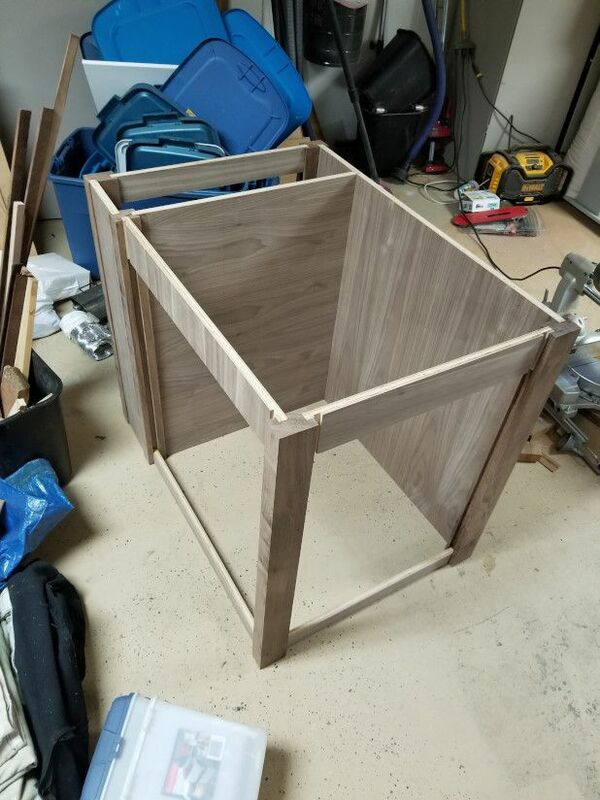 So a little more background on the build. 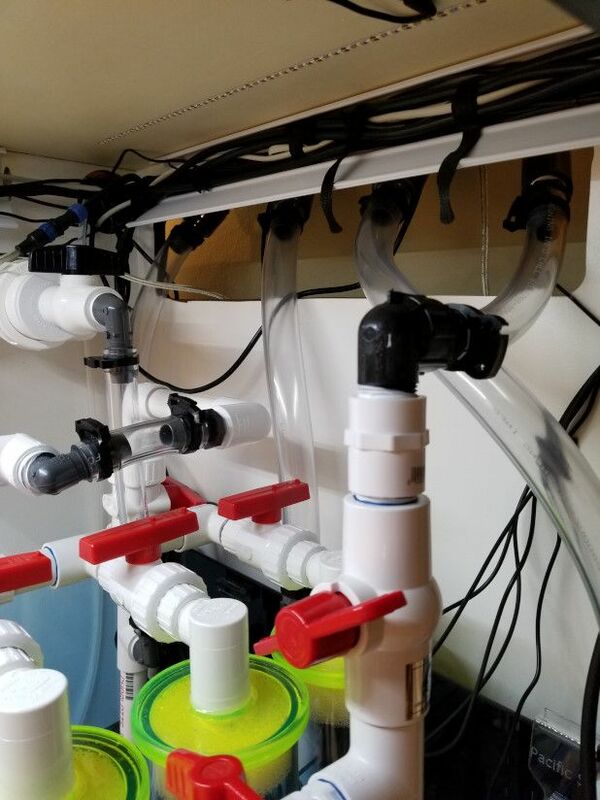 I am using a 5-stage BRS RODI system and I built a water mixing station with two 35g tanks. 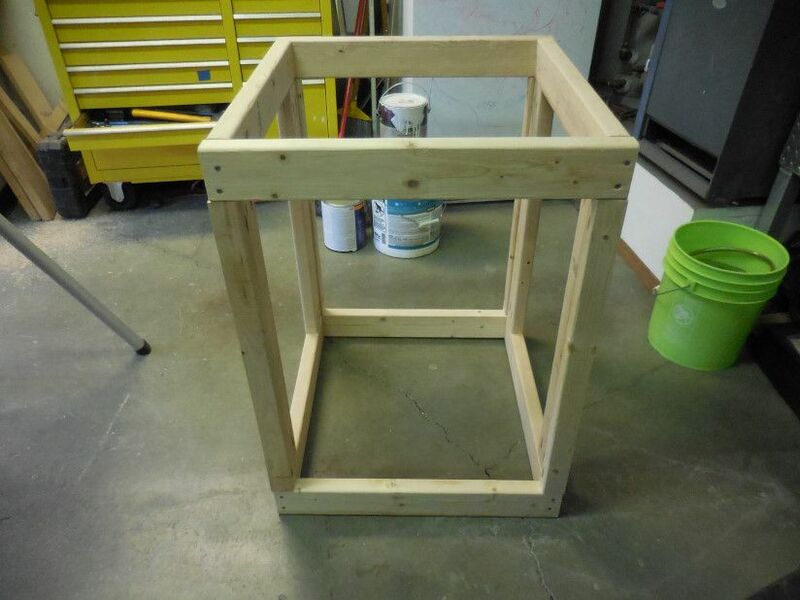 Started framing out the stand. 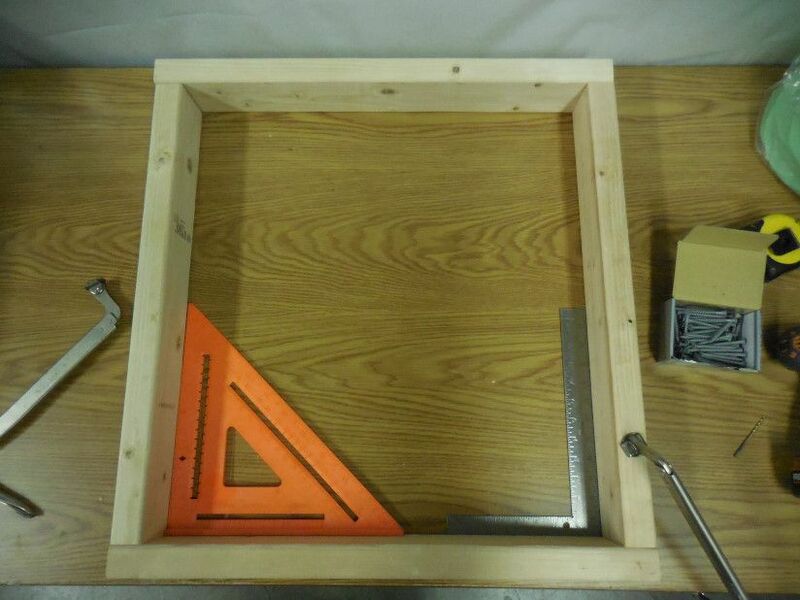 Got tops and bottom portions of the frame square. Got the frame screwed together. Used 2x4's for all the construction. Measured up pipes for plumbing with intent to gravity feed RODI water down to the saltwater mixing tank. 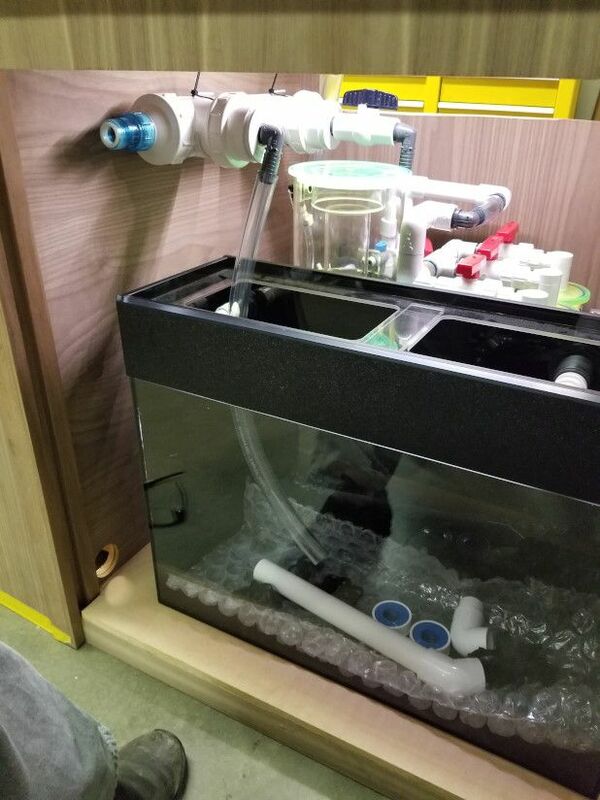 Hard plumbed some PVC down inside saltwater mixing station to improve circulation in the tank. 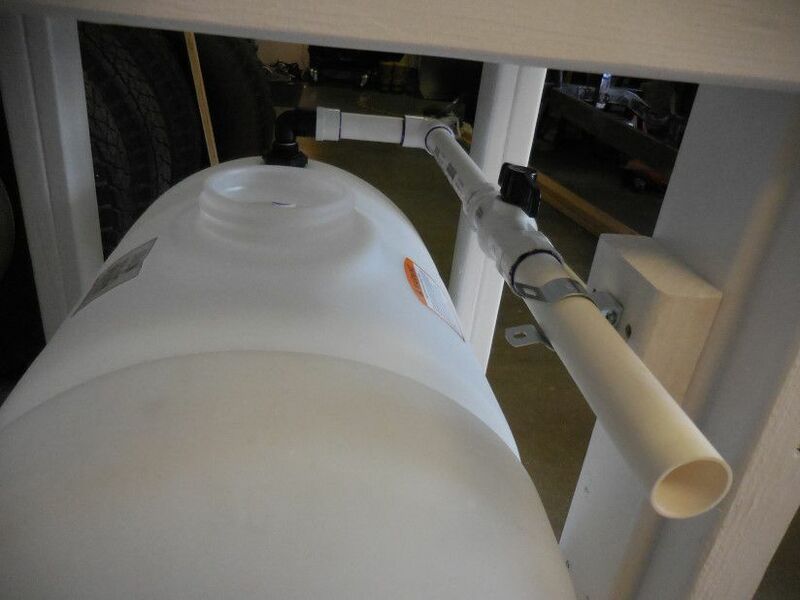 This is the bottom tank plumbed with a ball valve to close off this tank for when I want to pump out RODI only. More plumbing with the top tank on the stand which was also painted in the interim. Using an Iwasaki external pump connected to a timer. 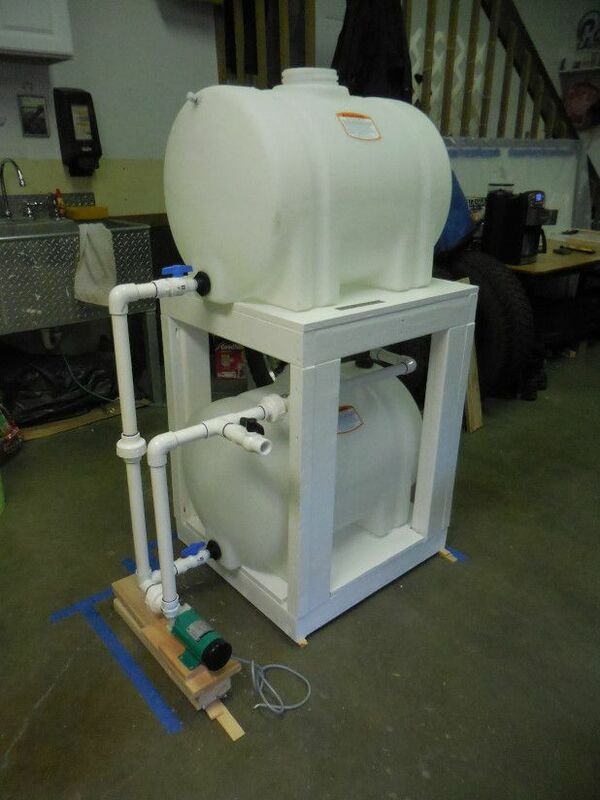 Timer will turn on the pump three times a day to continue to mix the saltwater every day. It was an extremely tight fit getting the mixing station into our laundry room but that was planned. 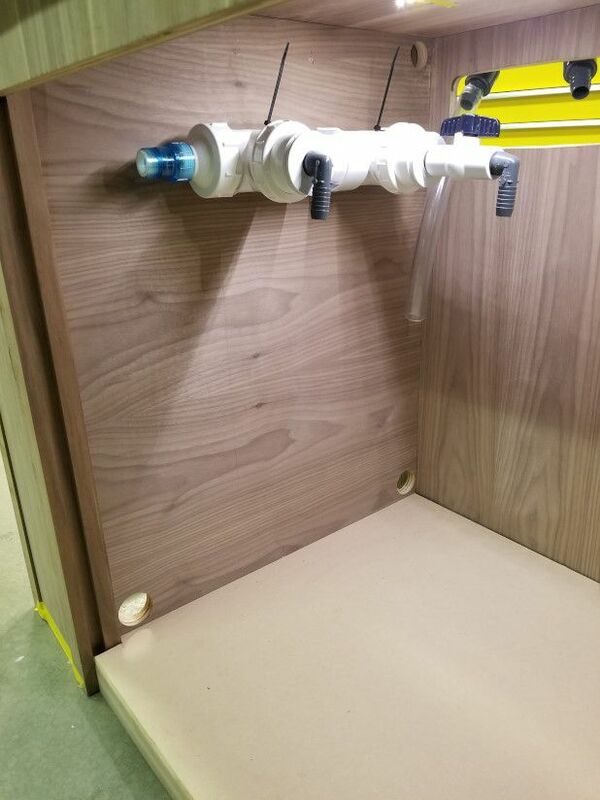 Supply and waste lines were installed using the water supply and drain available via laundry plumbing. 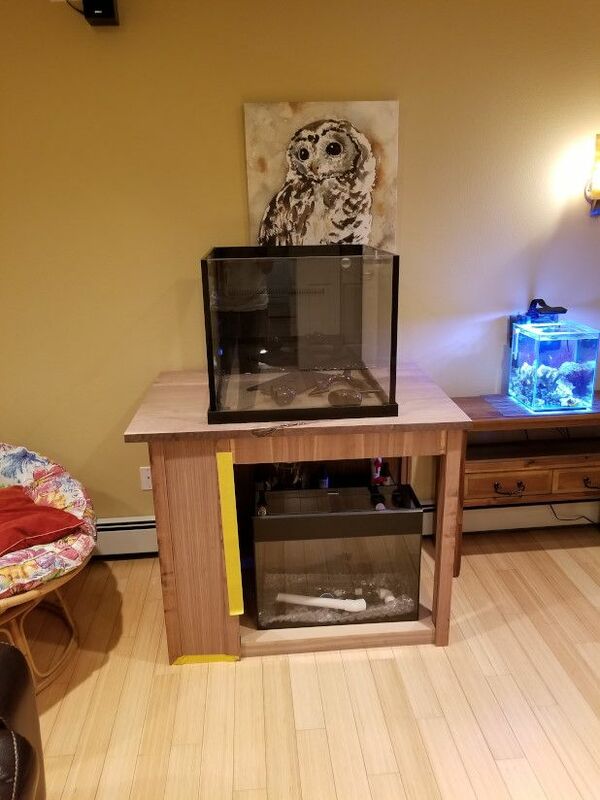 Anywho back to the tank and stand build. One of my challenges was mounting the UV sterilizer inside the stand. It is always fun mounting a cylinder to a flat surface when the manufacturer gives you no provisions for mounting the assembly. So my idea was creating a cradle to hold the sterilizer in place. I used two 3-inch PVC tee fittings and cut out the tops of these with a die grinder and cut off wheel. I then drilled holes in each tee fitting so I could screw these fittings to the inside of the stand. I made sure to suspend it low enough to be able to remove the bulb and maintenance. As Ace Ventura would say "fit like a glove!" 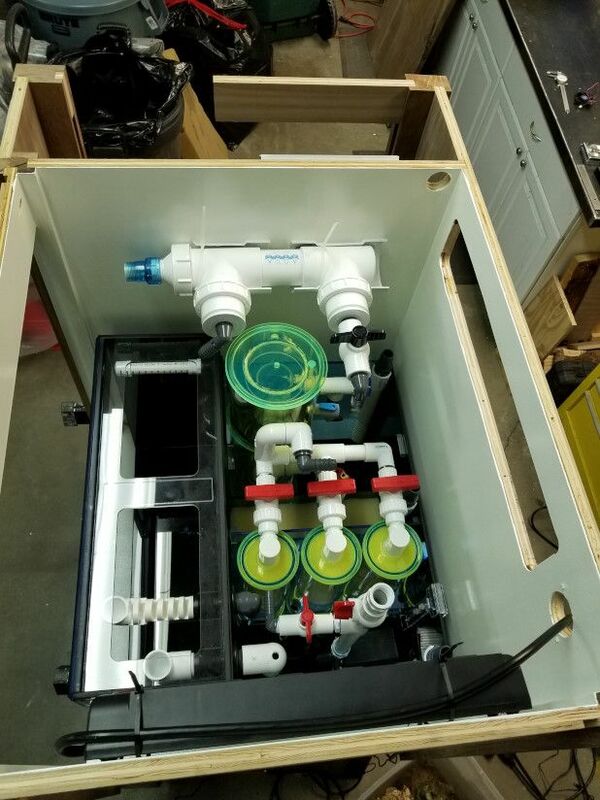 Here is a pic of the sterilizer mounted along with the sump and refugium to verify clearances. Proceeded to paint the interior of the stand white. 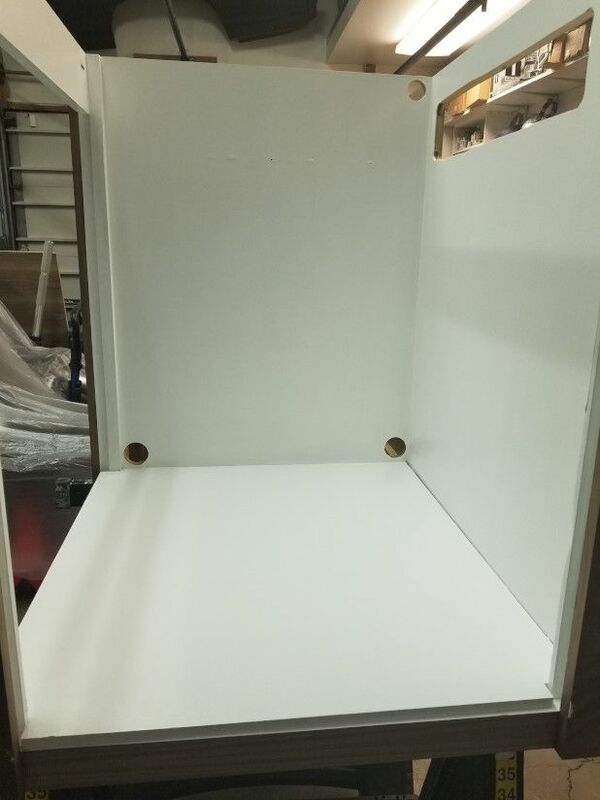 I did two coats of white latex paint plus three coats of polyurethane to seal the interior. 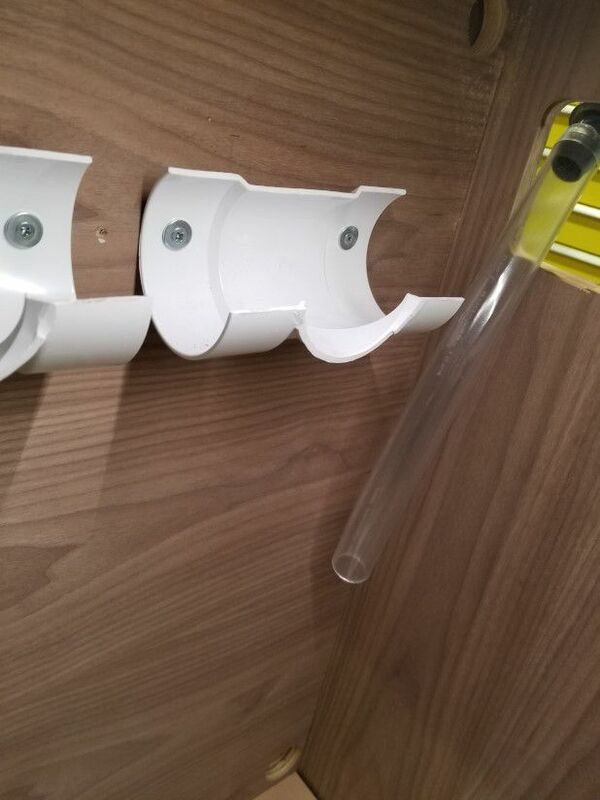 I would then silicone the gaps and seams to contain any leaks. I wanted to add some character to the stand. 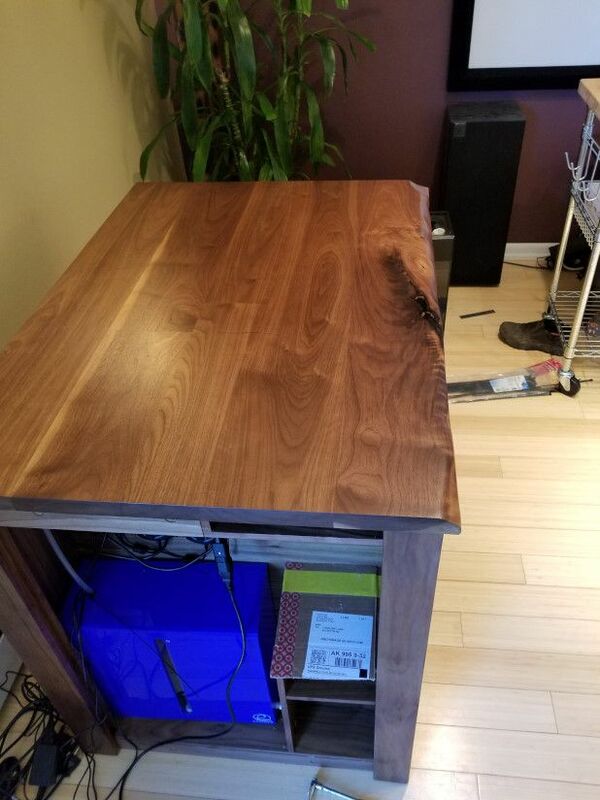 The top has a butcher block style top and I decided to create a live edge on the front edge. 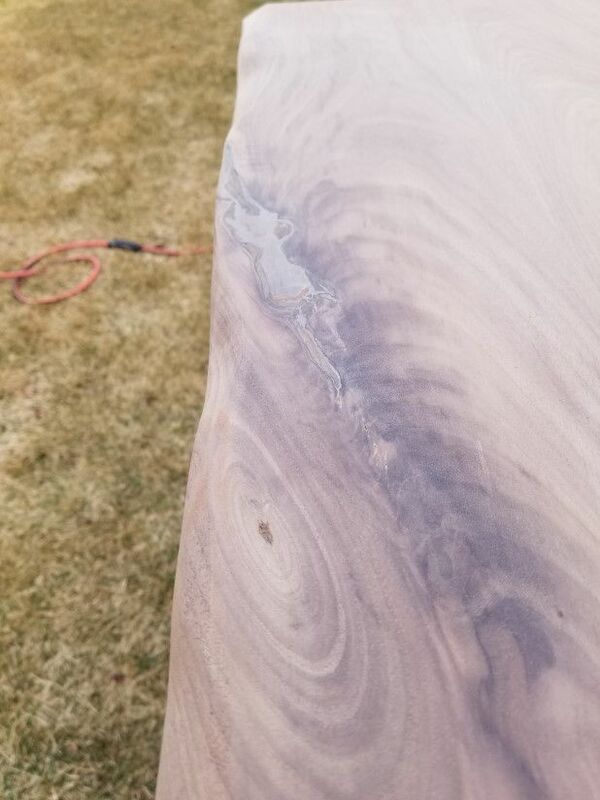 There was a really cool knot in the wood as well and I wanted to keep it as part of the final finish. I used my 5-inch grinder with 60-grit flapper wheel. 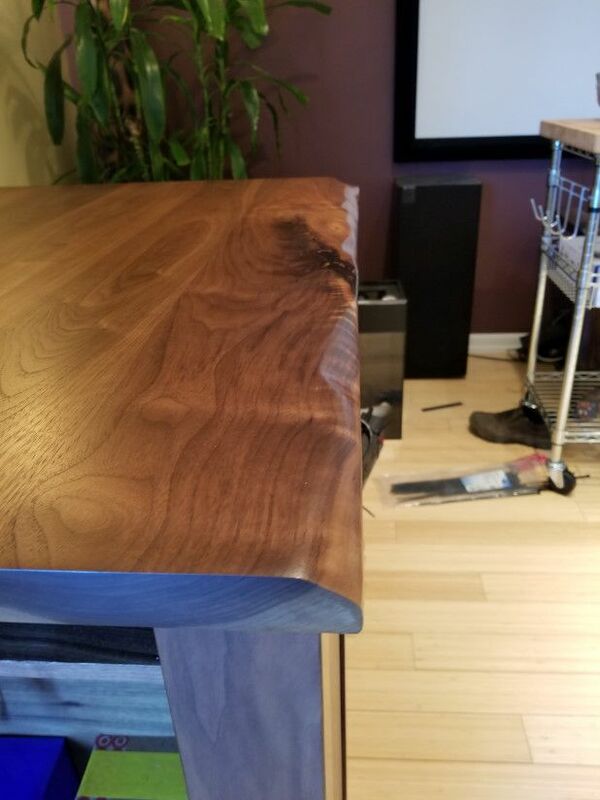 It made quick work of the walnut. I just penciled in a wave-like pattern and went to town on it. I then changed to a 120 flapper wheel to get rid of the deep scratches. Then finished with an orbital sander with 220 grit. 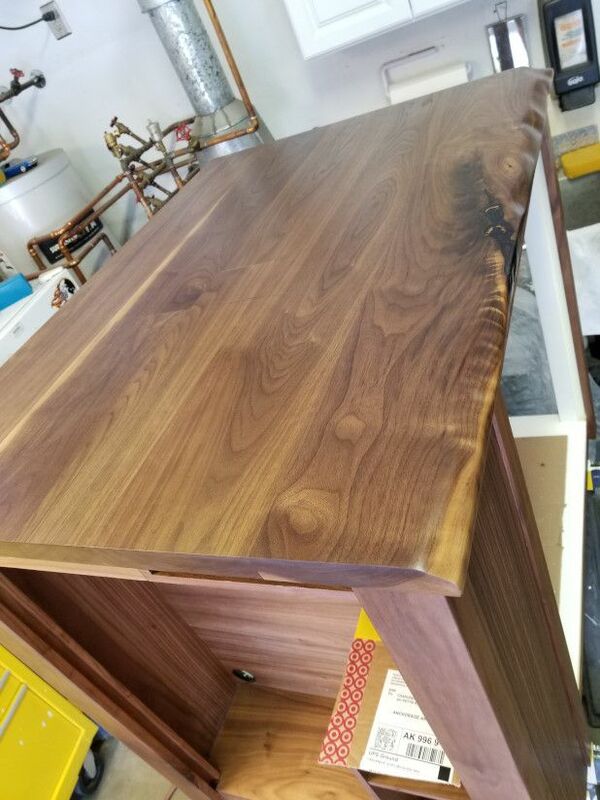 I sanded all of the walnut ply panels, posts and the top and applied a polyurethane from an aerosol can. Everything turned out nice. I really like the dark walnut. 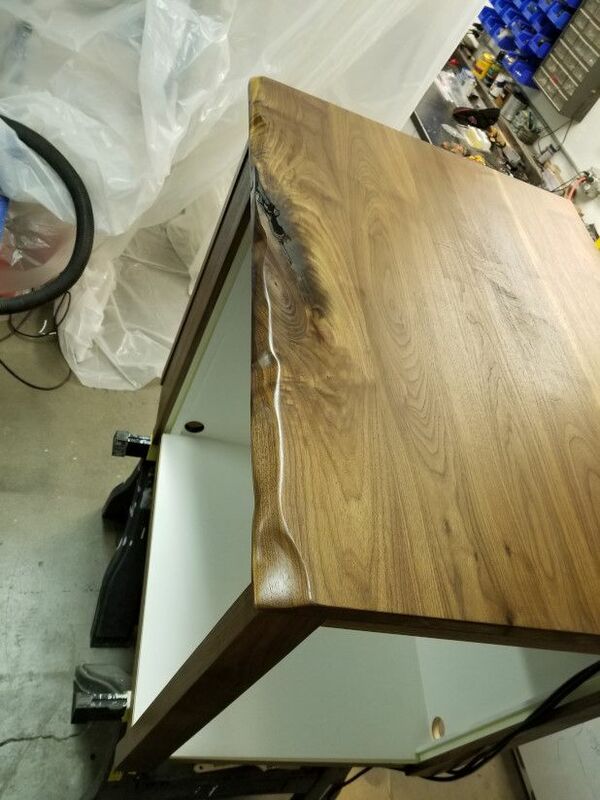 The grains really came alive after the satin coats. 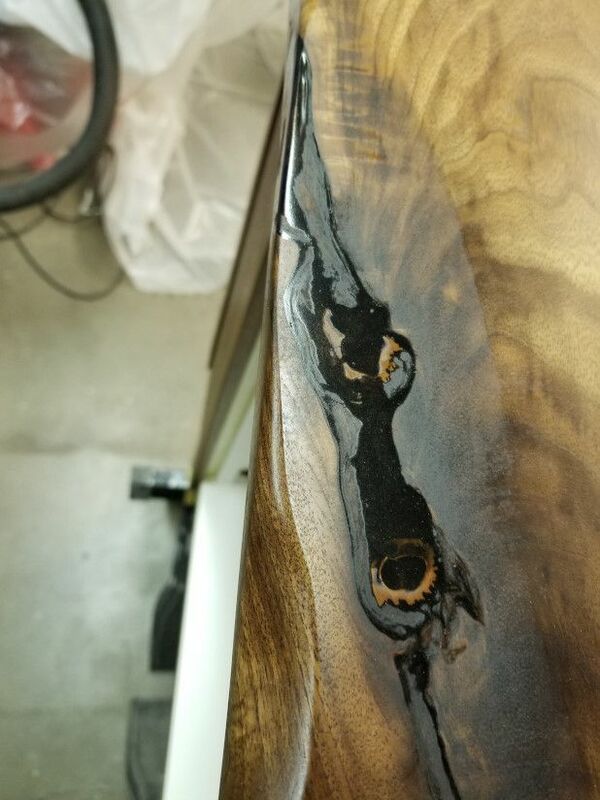 This knot is buried in epoxy. 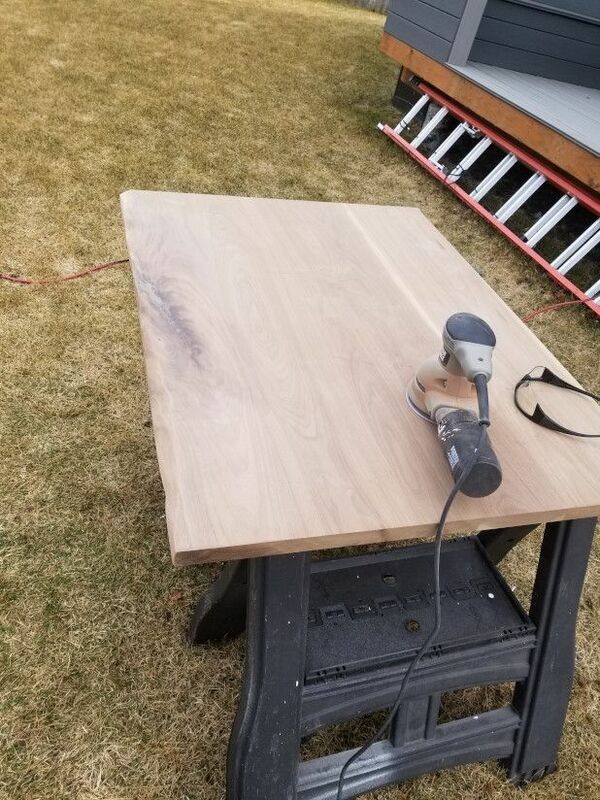 Used some stuff they use on restaurant table tops which I found at Lowes. I sanded the epoxy with some higher grit sandpaper to provide as clear a finish as possible. 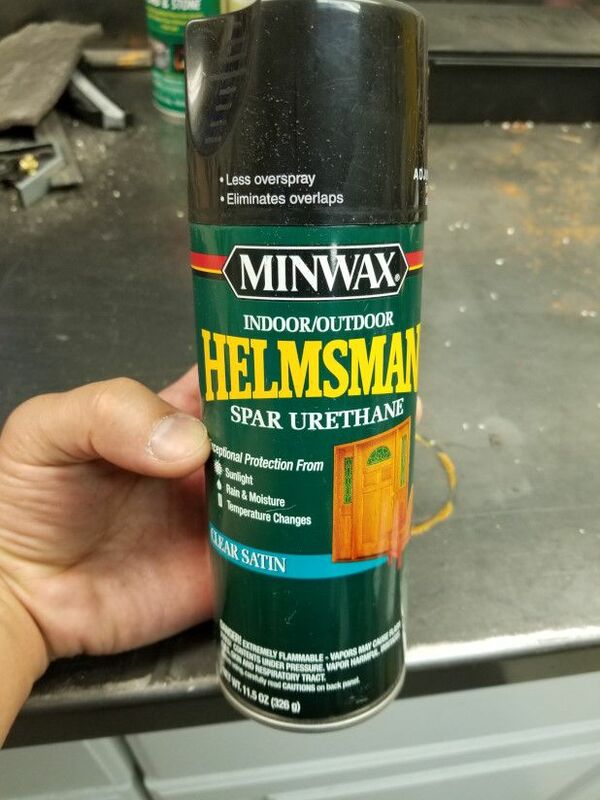 Everything got three coats of this Minwax spar urethane. This stuff is awesome! It lays down flat and turns out just as good as using a spray gun. I just lightly sanded with gray scotch brite between coats. This was all done with the satin finish but they offer a semi gloss and a high gloss finish as well. Stand was moved into the house for the last time and set in place. 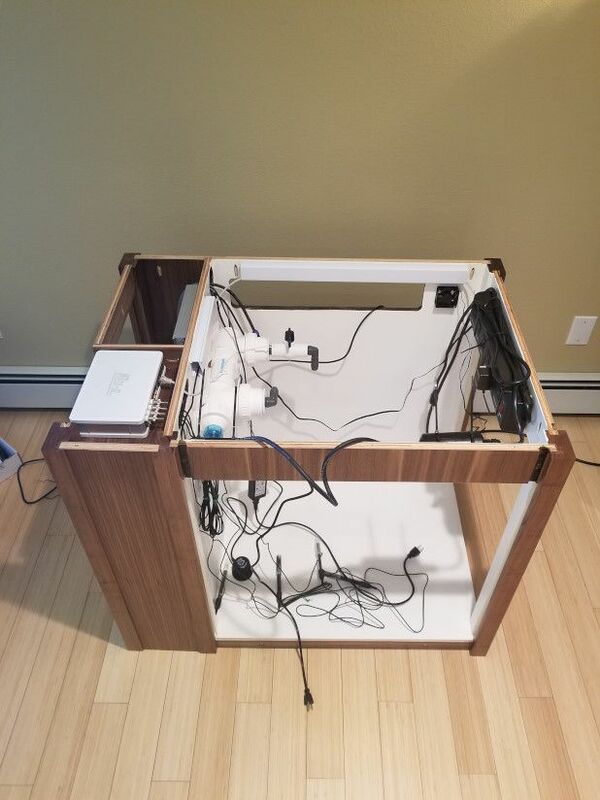 Now it was time for wire management. 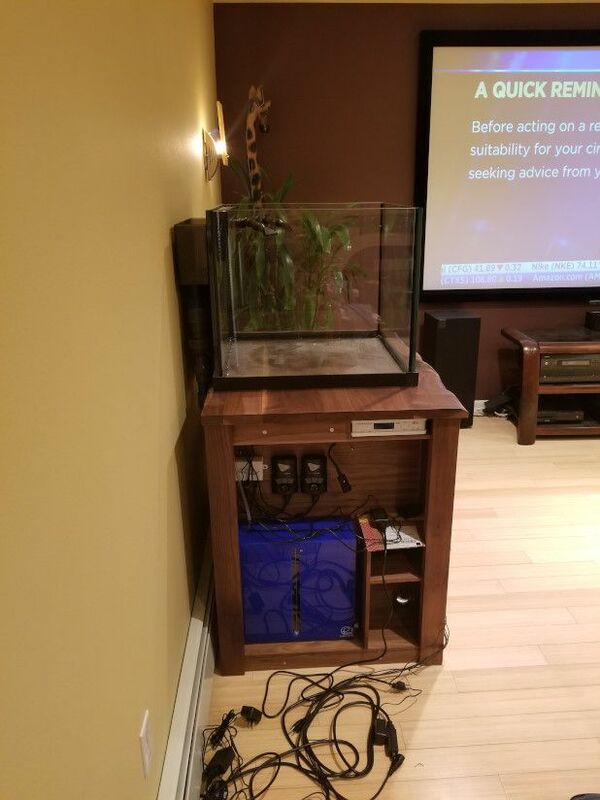 I placed the top on the stand so I could place the tank on it for good. Excuse the mess. Tools and parts everywhere! Connected my sump LED lighting. Great work lights. 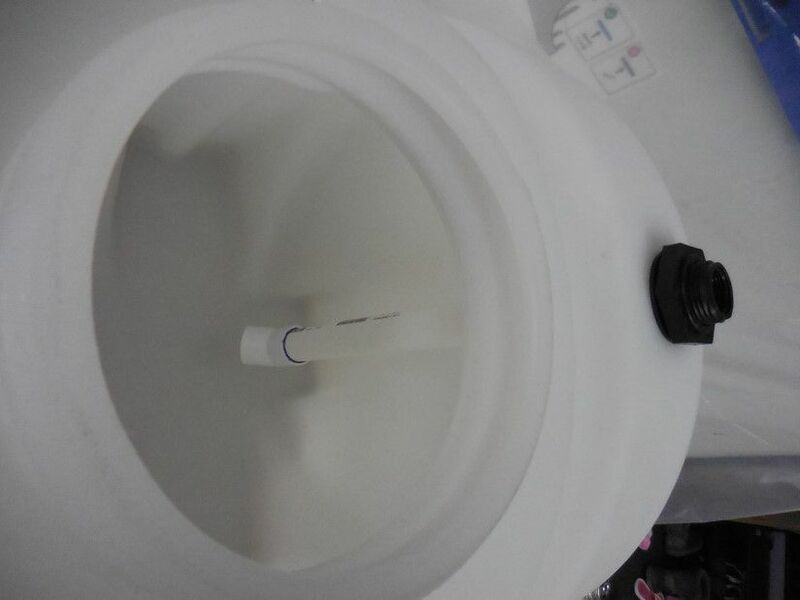 The science experiment light. So here I have a separate blue LED strip light which will remain on all the time. 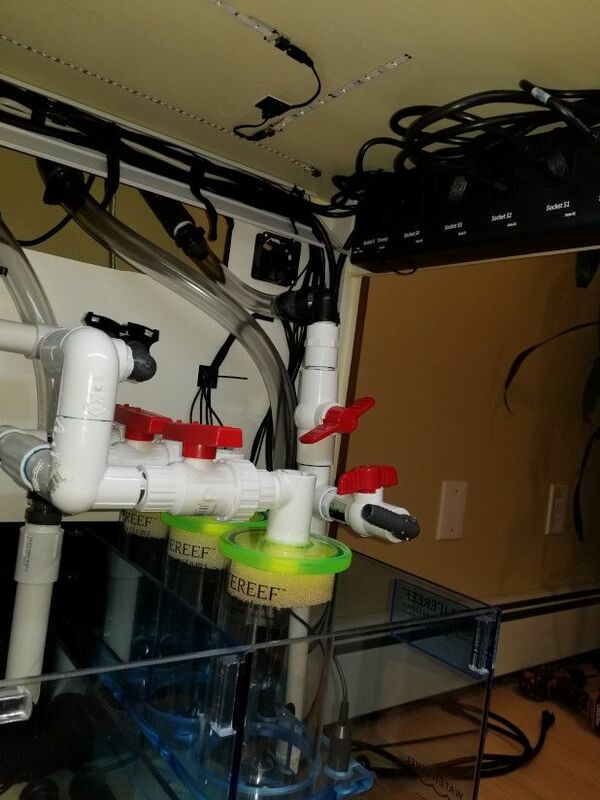 I asked Jeff at Lifereef to add some green accents to the skimmer and reactors. They glow pretty good in the blue light. Here is the tank on the stand. Thanks to the wife we were able to get it on there without issue. We placed it in the room and made some adjustments before finally setting it. 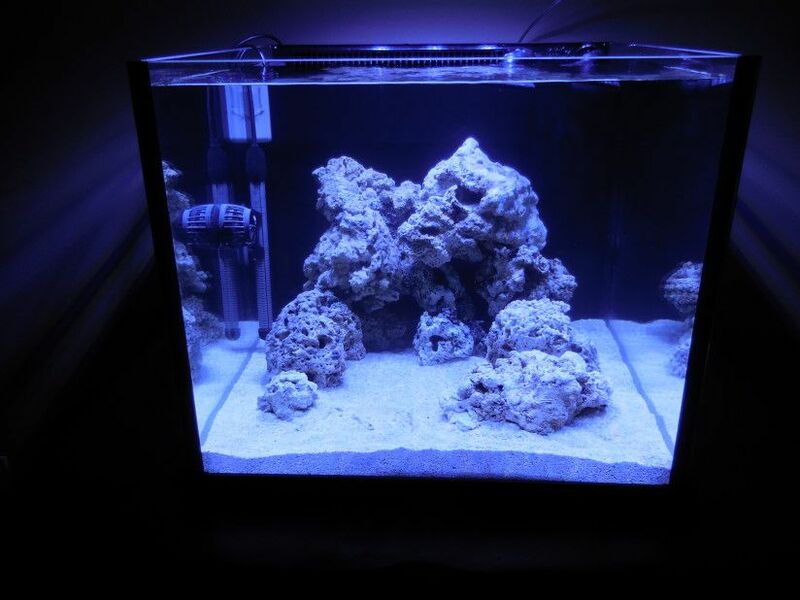 And that allowed me to center the light mounts over the tank. The Mitras light is suspended with their stainless wire ceiling mounting kit. It is a slick adjustable wire system. There are quick release buttons on the cables where the mounts attach to the light. You simply hold the light where you want it and press these buttons to release tension on the wire and move the light where you want to. This is a nice feature for maintenance. 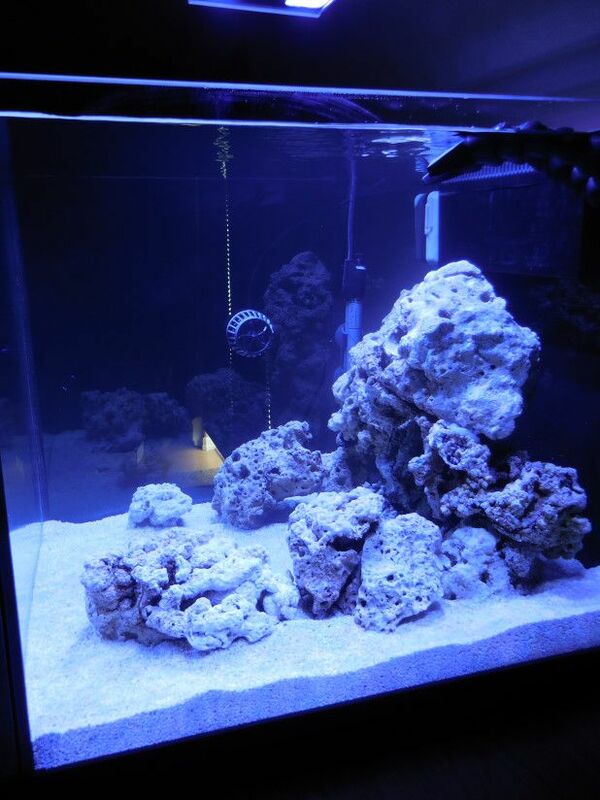 You can pull your wire through the mount to raise the light to do your work in the tank. After maintenance it is quick and easy to lower it back down where you had it. Helps with leveling it too. Wow... Incredible job man!! I'm a big fan of this stand! Keep the pics coming! Thanks Ryan! I appreciate the comments. Of course! When will you be getting everything wet!? I did have two leaks and had to drain the tank a few times to resolve the issues. First was one joint not glued. Doh! Second one was the gaskets for the Synergy Overflow. I did not have one pair on the glass side. Once I glued the joint and moved the gaskets all was good to go. My scape is comprised of a couple of mountains which fall down to a lagoon shape. 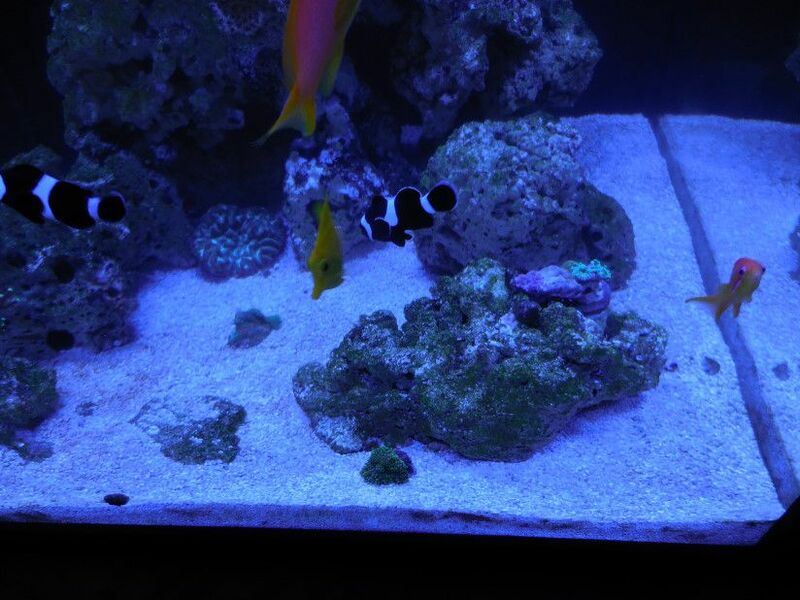 I am hoping the lower areas will be good for some zoas and SPS which do not require intense lighting. So right now I am cycling the tank. Got the overflow tuned and the main siphon is dead quiet. The return pump is a little noisier than I like but I will see how loud it is when I add the doors. The sand I added was live sand but the rock was all dry rock. 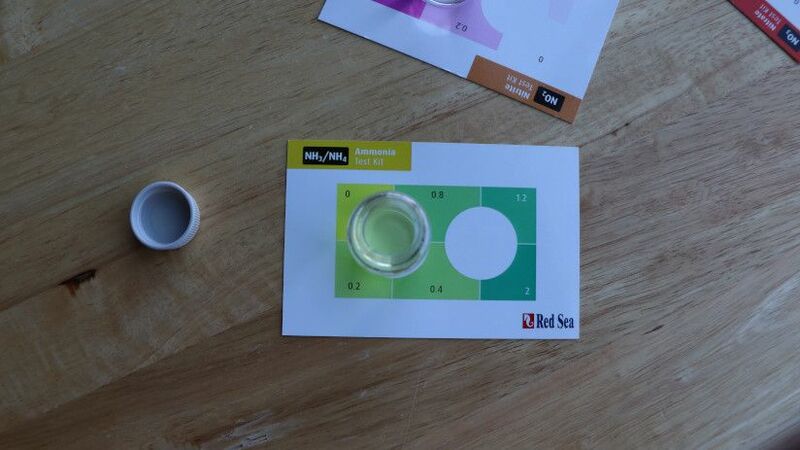 I have been using Aquavitro seed bacteria and got ammonia as high as .8 on the first few days. Nitrites started at .2 on the first day and spiked up to 1.0 on Day3-5. 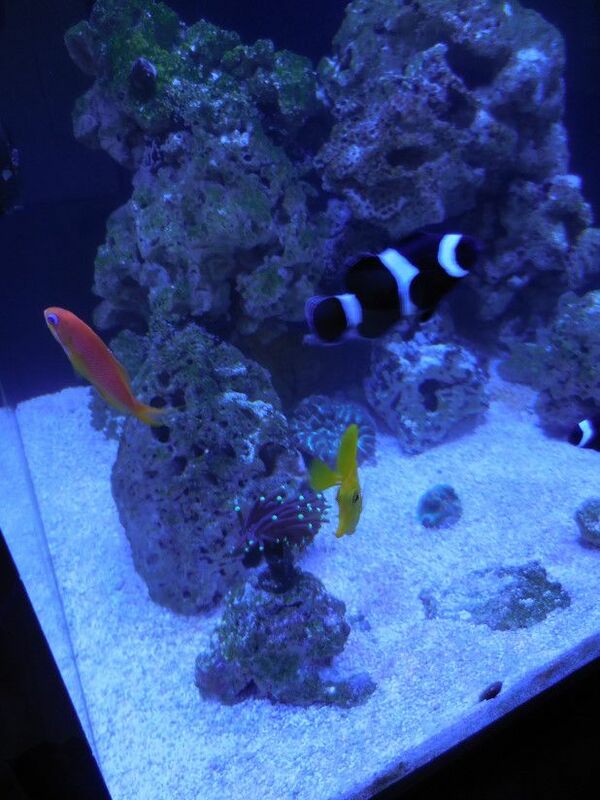 Nitrates steadily climbed to 10 and are starting to fall off. On Day 8 I have .2 for ammonia, 7ppm for Nitrates, .15 for nitrites, and pH is at 8.0. Hopefully I am on my way to full cycle here in a few days. In the meantime, I get to learn how to program/configure Powerbars and Profilux while I cycle. Time for an update! Tank has been running fine. 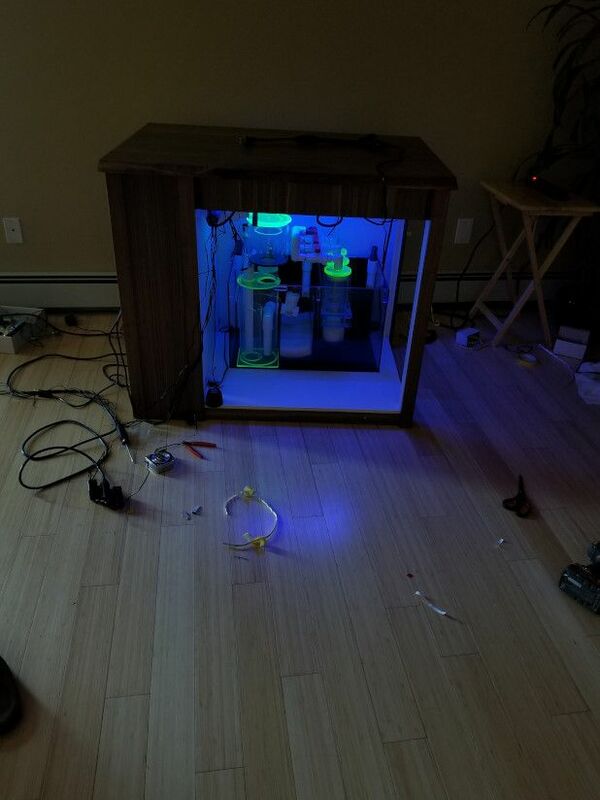 Shortly after the tank cycled I started getting diatoms and a little bit of the hair algae. I added ten small snails, one turbo snail, and six hermit crabs. 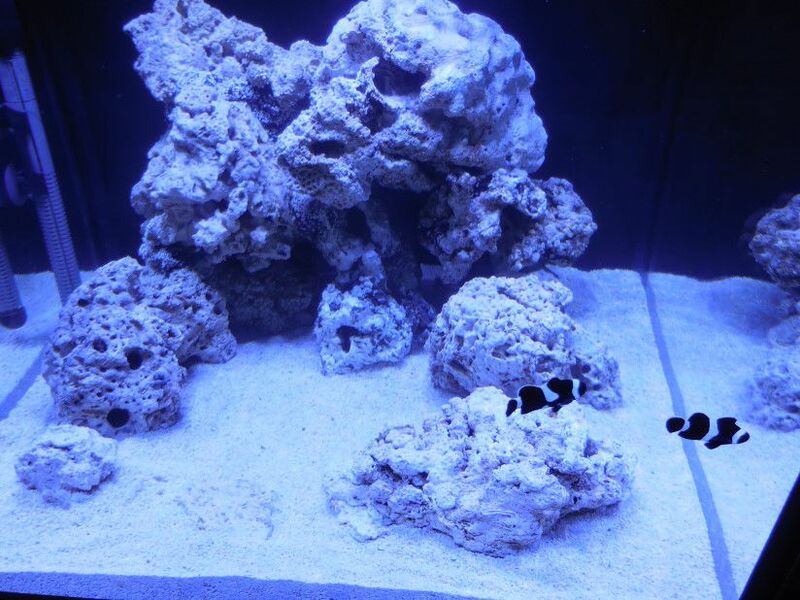 I also introduced two black and white clowns we have been keeping in a nano tank. Nitrates continued to remain low around 5-7ppm. 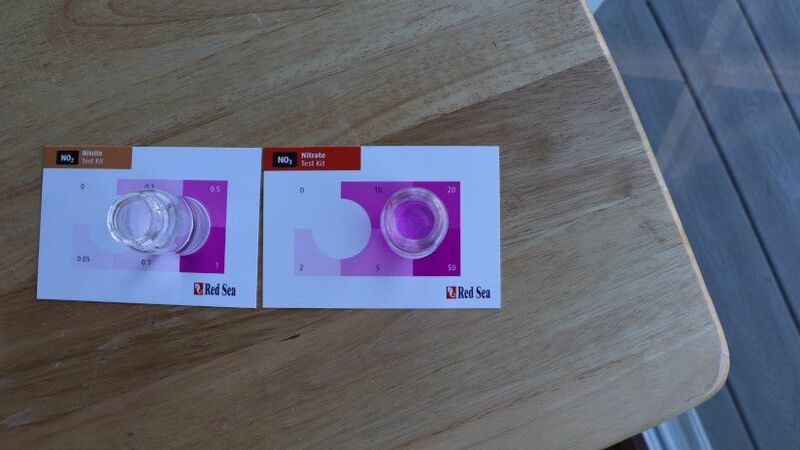 Ammonia 0 and nitrites 0. 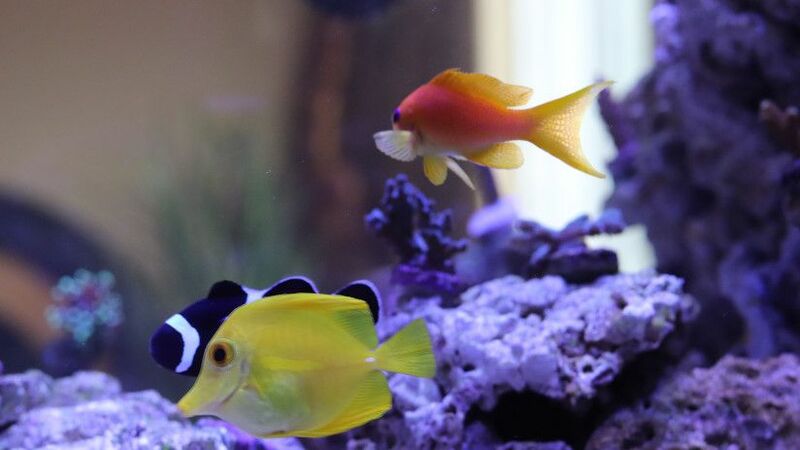 I after a few weeks I added a fighting conch, small yellow tang, and an anthia. 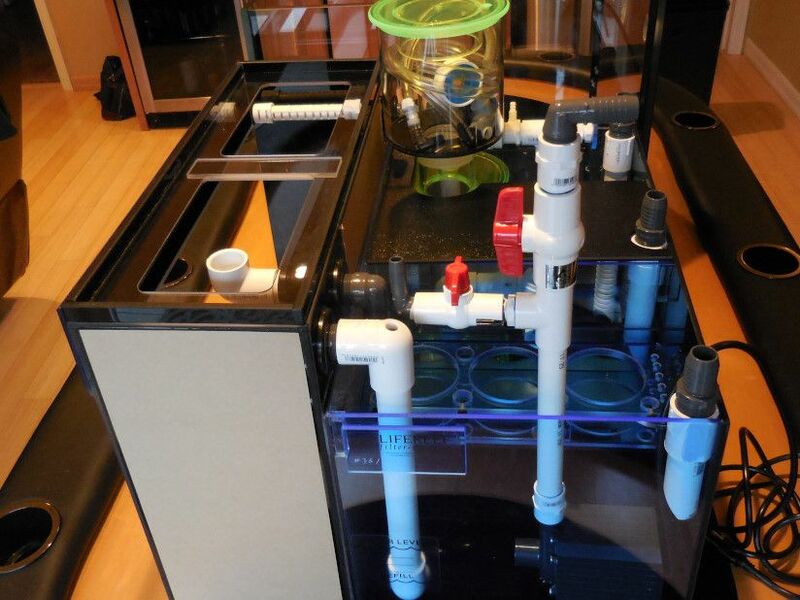 The goal in August was to bring the refugium online and begin to grow some chaeto. 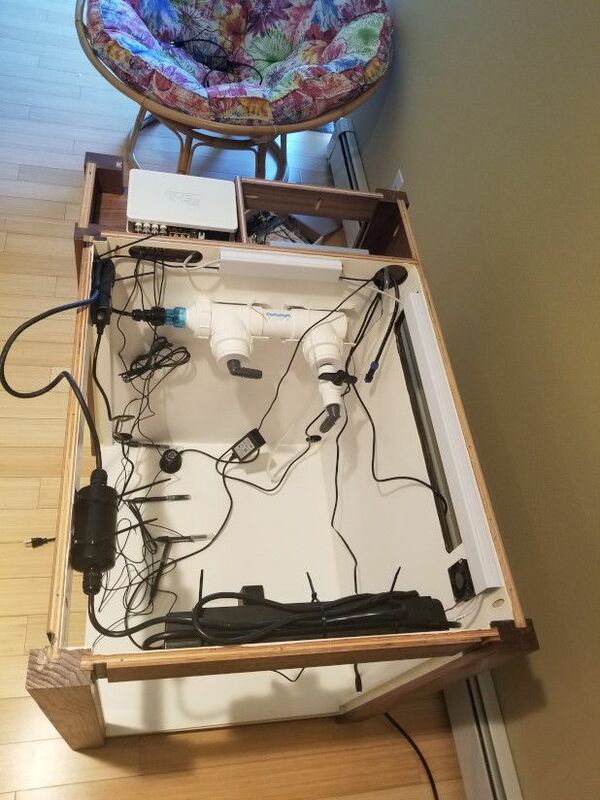 It took me almost three hours to dial in the flow when adding the refugium. 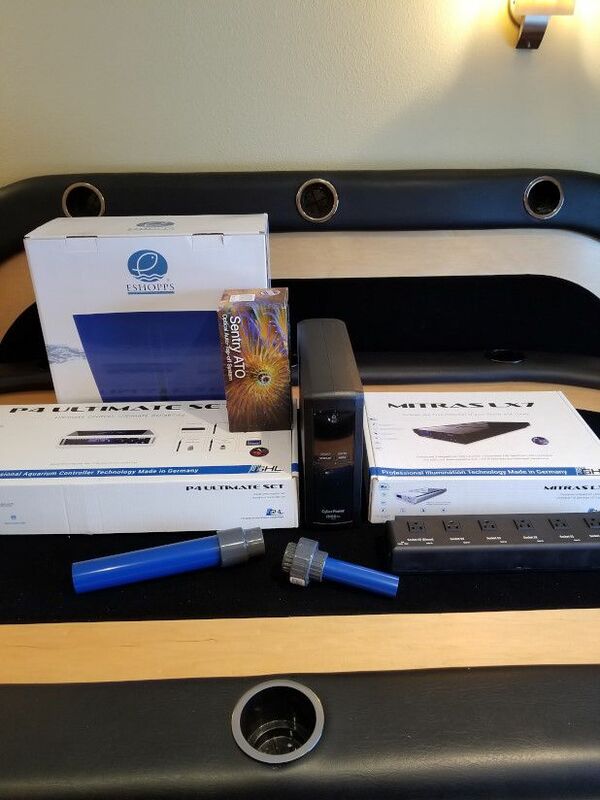 The refugium is fed by a T off of the return pump and I also have the output of the UV sterilizer outputting into the refugium. This messed with my main siphon but I finally got it all balanced out. 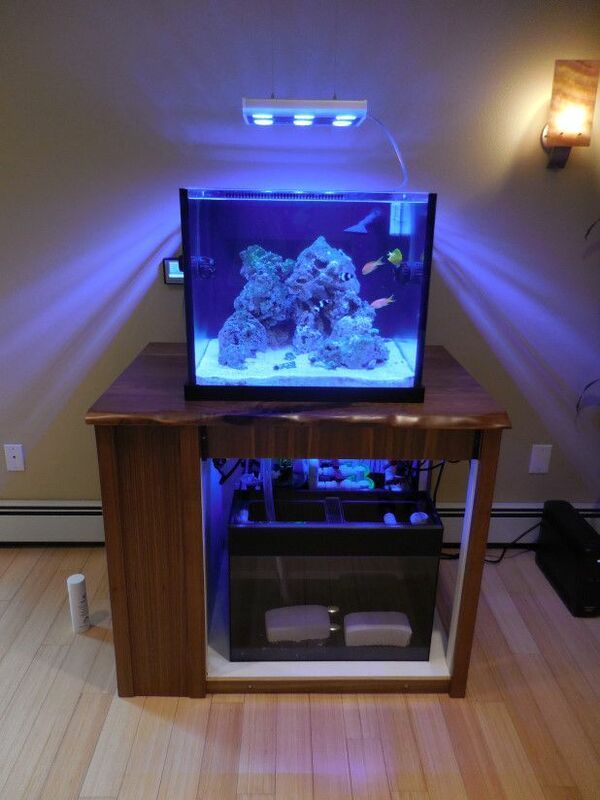 Here is a pic of the refugium installed along with two marine pure blocks. Sorry for the poor pics. Just have the cell phone and a point and shoot digital camera. 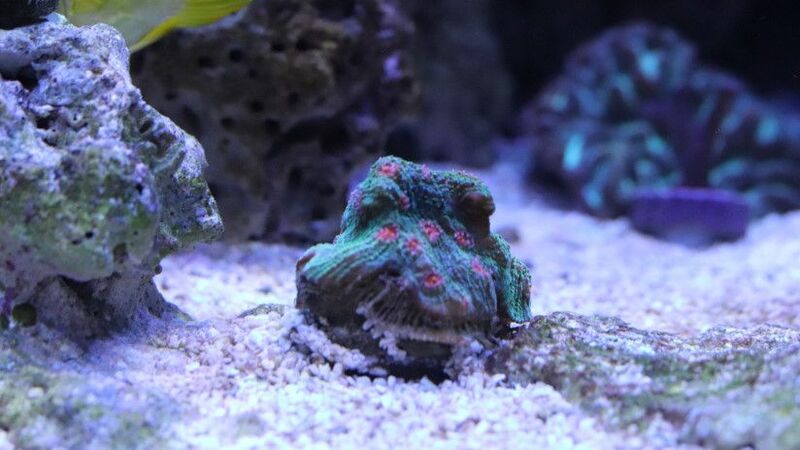 The wife's tank was being taken over by LPS so she gave me a green hammer and a duncan. 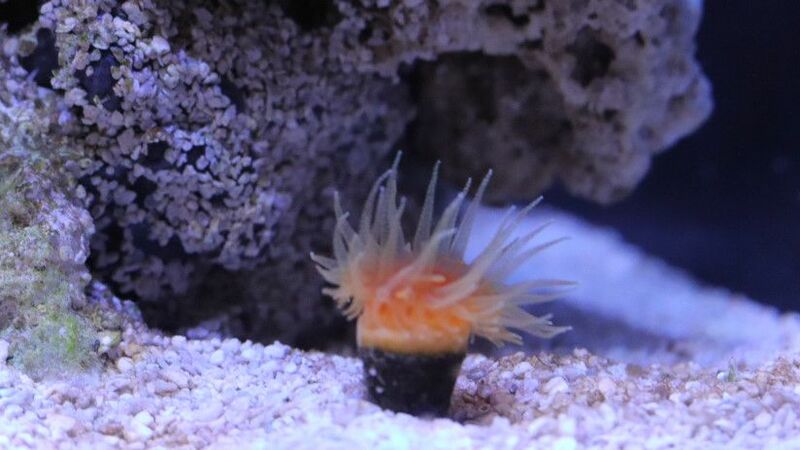 I picked up a ricordia mushroom from the local fish store. Oh and the anthia needed a buddy so I added a second one. Here is a full tank shot. 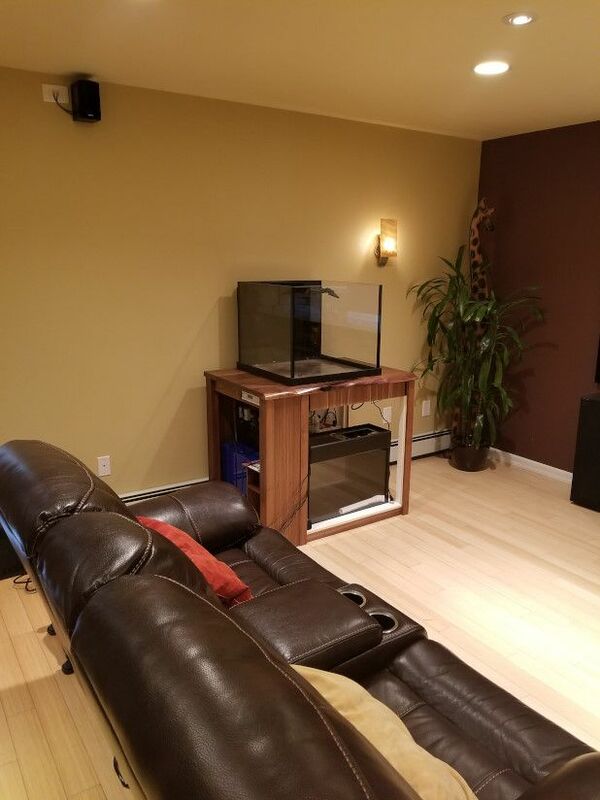 I am amazed at how well all the fish get along. 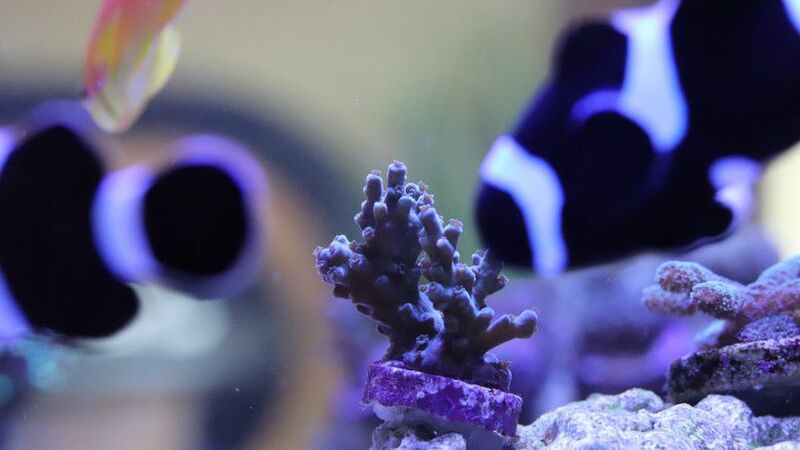 The tang is always curious and isnt shy when you approach the tank. 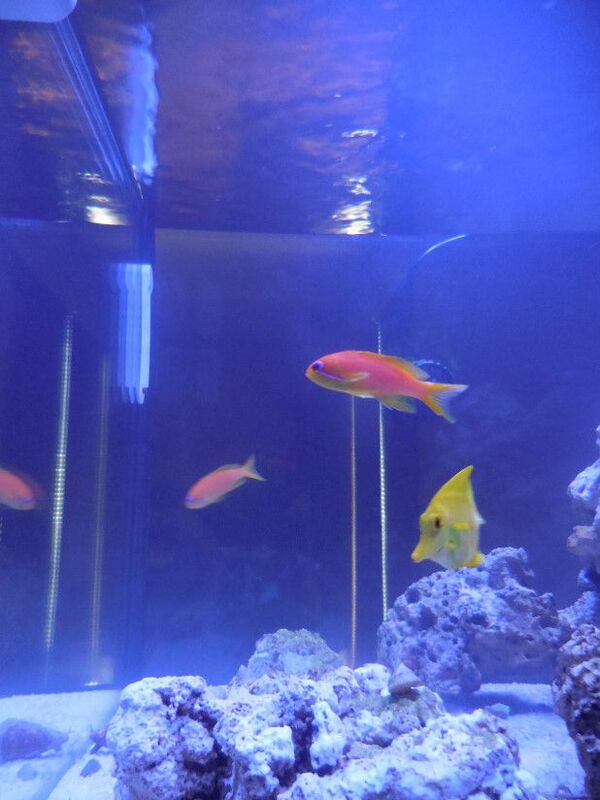 The anthias were shy at first but they began hanging out in the water column after a few days. 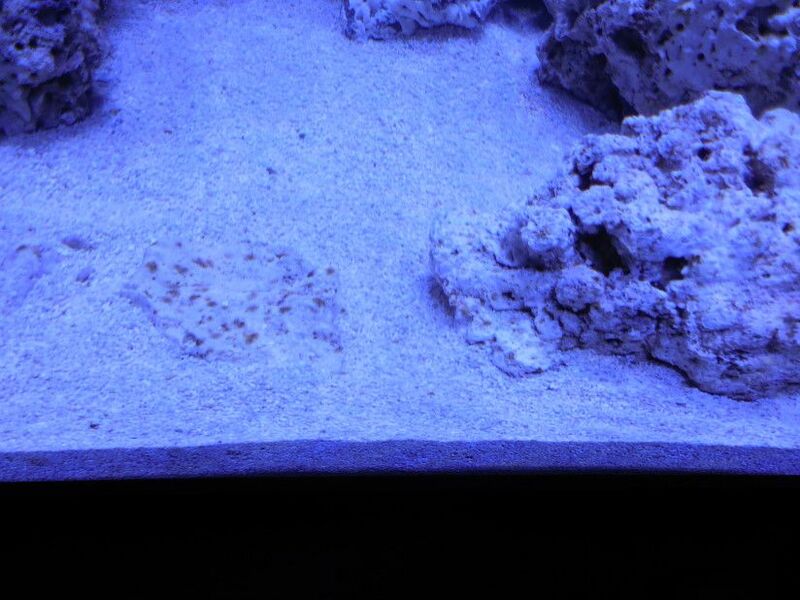 A couple of weeks later I added a purple torch and a closed brain from the wife's tank. 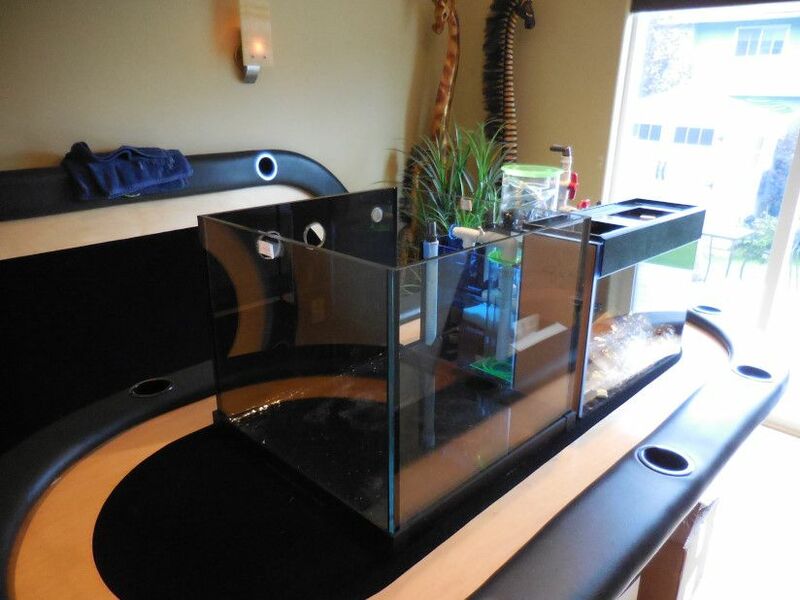 The goal was to make this tank an SPS dominant tank so I had been researching stores who would ship to me. One other thing I wanted to pursue was getting a new camera. It would make the hobby a little more fun. Here is another pic of everybody and you can see the closed brain in the background. Been tinkering with the light settings as the hammer and duncan were closing up for a week. I think there was too much intensity. 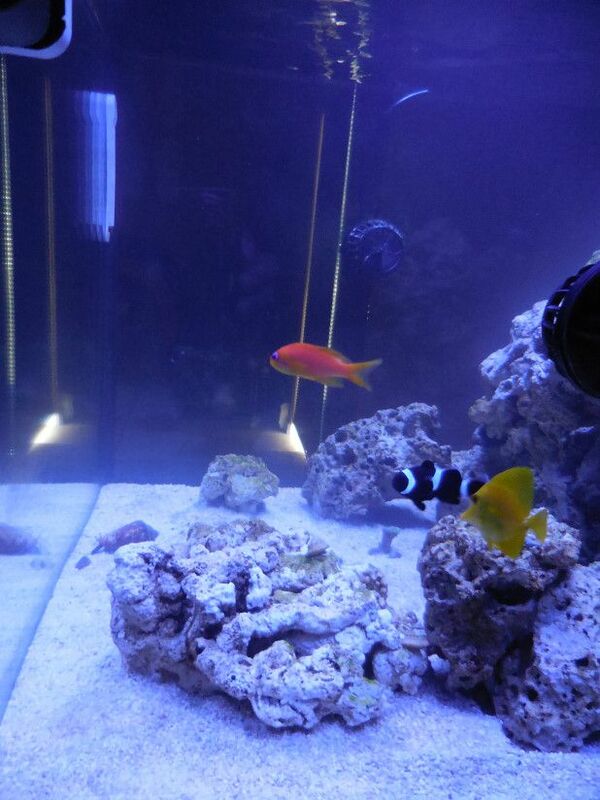 At this stage it was probably about six weeks after the tank had cycled. Ammonia is nearly undetectable if not zero. Nitrites were at zero and nitrates at 5ppm. Really impressed with the new DSLR camera. Just shooting raw produces great images. 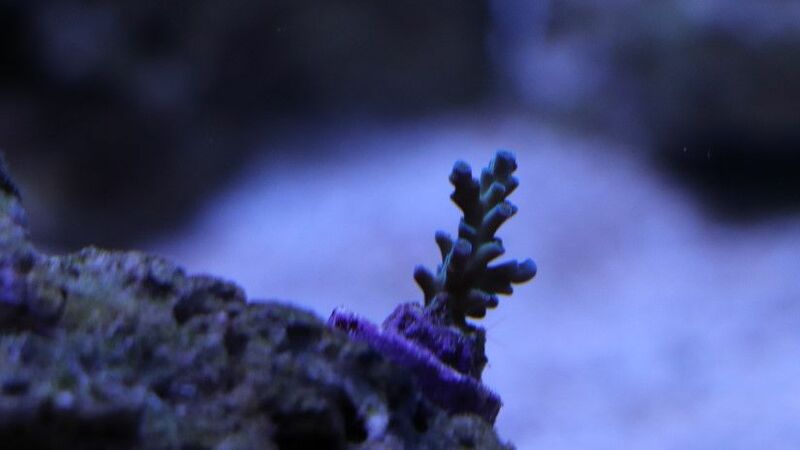 Pic of sun coral from wife's tank. Ordered a 10-pack of SPS but the shipper did not label the bags. So attempting to identify them.